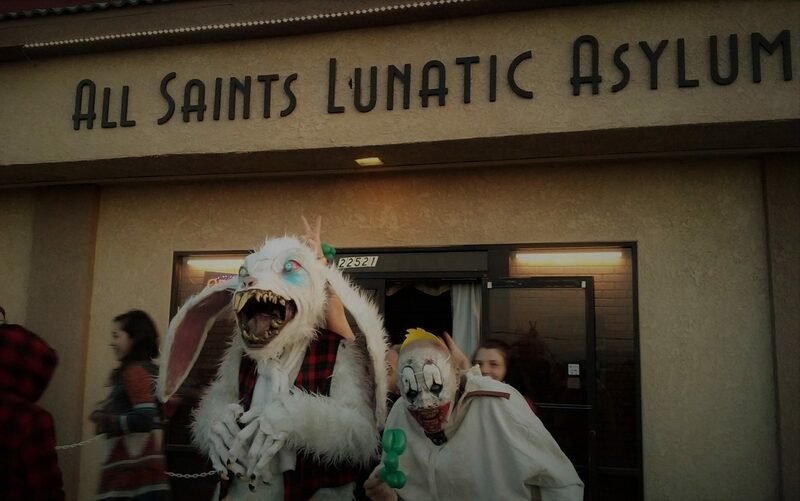 Part 1 of Hollywood Gothique's 2010 Halloween Haunt Odyssey was filled with gruesome mazes in Burbank; Part 2 featured more atmospheric yard haunts in Woodland Hills and Tarzana. Part 3 offers a mix as we move on to the Westside, visiting CrestaFallen Cemetery in West Los Angeles, the Eternal Rest Cemetery in Venice, and the House of Restless Spirits in Santa Monica. The combination makes for a fascinating variety of Halloween horror. 2010 marks our first foray to CrestaFallen Cemetery at 9348 Cresta Drive in Los Angeles. 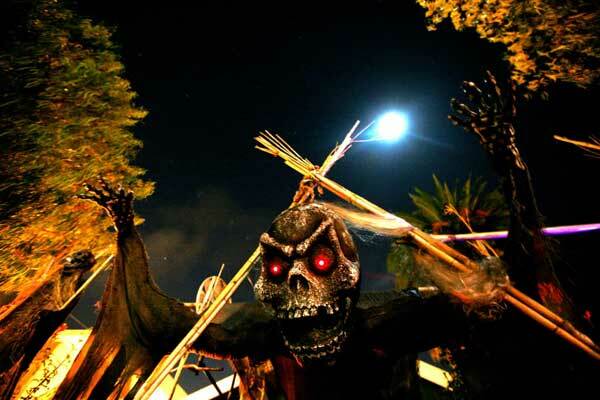 This amateur yard haunt suggests a more elaborate version of another of our 2010 discoveries, Fallen Angel Cemetery (reviewed in Halloween Haunt Odyssey, Part 2: Woodland Hills Horrors): both utilize a front yard with a steep incline to pack in lots of props, creating creepy cemeteries that offer family-friendly Halloween horror. CrestaFallen features more moving mechanical characters, many home-made, and there is a short maze (actually an enclosed ramp leading toward the house), with two or three scenes. We went a day early, when all the props and effects seemed to be in place; we understand that on Halloween night there are some live actors but nothing too scary for kids; the tone is more Disney's haunted mansion than the Knotts Berry Farm Halloween Haunt. CrestaFallen Cemetery hands out candy from 6:00pm to 9:00pm on October 31 each year. Up next, geographically speaking, is the Eternal Rest Cemetery, situated at 414 Rose Avenue in Venice - a sleepy little street that mixes businesses and residences, so if it starts to look as if you are looking for a home haunt in the wrong place, don't give up. We first enjoyed a visit to Eternal Rest Cemetery in 2009; 2010 offers the same basic presentation, but even better. There is a decorated front yard with some mechanical characters, and around the side of the house there is a tight walk-through maze. 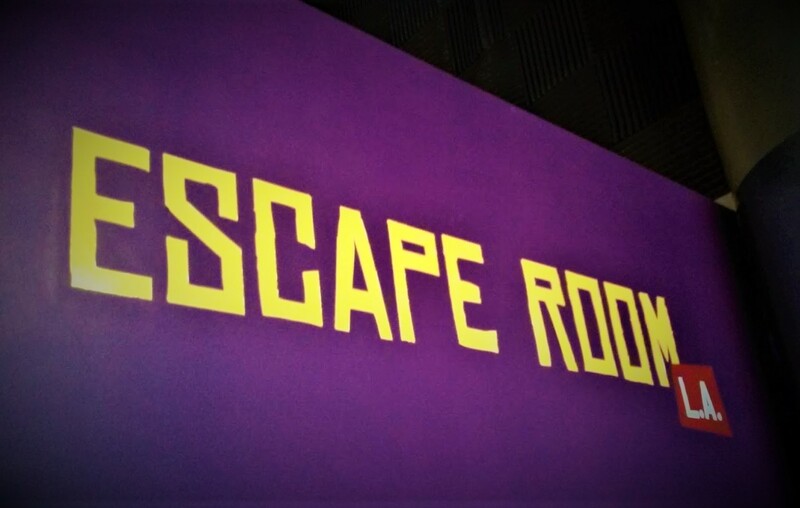 The corridors are narrow, with tight turns and tiny rooms, packing several scares into a small area. This one is definitely too terrifying for the tiniest trick-or-treaters, although children over ten might be okay, depending on how eager they are for a fright. The style of scares is in keeping with the Halloween season and the cemetery setting - no chainsaws, just ghosts and ghouls. Unfortunately, Eternal Rest Cemetery operates only on Halloween night each year; fortunately, after opening its gates at dusk, it continues until late in the evening, as long as crowds remain - and there are crowds of eager visitors, screaming in joyful fright. 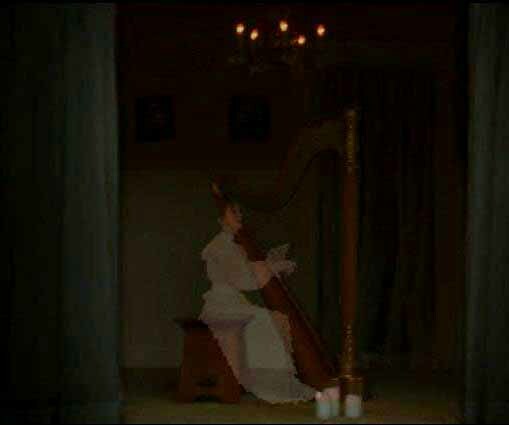 A ghost plays harp at the House of Restless Spirits. Our last stop on the Westside for 2010 was the supremely spooky House of Restless Spirits at 1008 Euclid Street in Santa Monica. 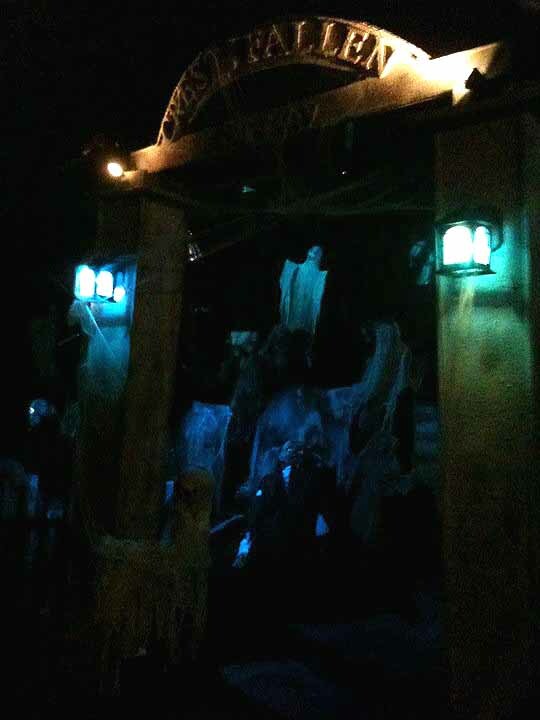 We loved this yard haunt ever since our first visit; it changes little from year to year, but it never disappoints, adding three or four new effects to its awesome arsenal of ethereal manifestations. Of all the amateur Halloween attractions in Los Angeles, this one is the most perfect realization of what we imagine a real haunted house would be. There are no actors and no overt shocks. Instead there are spooky spirits that emanate from windows with a dim flash of light or leave footprints walking from the house to the front gate, which then rattles as if shaken by an unseen hand. Ghosts manifest in the dark water of a barrel or appear from portraits; others unseen presences cast shadows on walls or glow in the darkness of a woodshed. One of the eeriest and most effective lies in the backyard cemetery, filled with tombstones illuminated by candles: a ghostly skull rises from beneath the earth, leans toward the candle nears its tombstone, and blows out the flickering flame. Unfortunately, the vision is impossible to capture on camera, so you have to take my word for how wonderful it is. The House of Restless Spirits is open October 30 and 31 every year. For the final leg of our 2010 Halloween yard haunt tour, Hollywood Gothique descends to the dark depths of Torrance for visits to Revenge of the Ninja and the Haunted Shack.